These are unusual members of the auk family, often nesting far inland in forests or on mountain tops. 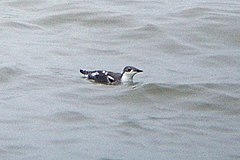 The Long-billed Murrelet was considered conspecific with the Marbled Murrelet until 1998, when Friesen et al. showed that the mtDNA variation was greater between these two forms than between Marbled and Kittlitz's Murrelets.